This morning, idling at an extra long, red light, I reminded myself that I had plenty of time to make it to my next meeting and there was no reason to get upset over the commute. As I took a deep breath and a look around, my gaze landed on something that appeared to be gazing right back at me – something cute and puppet-like. 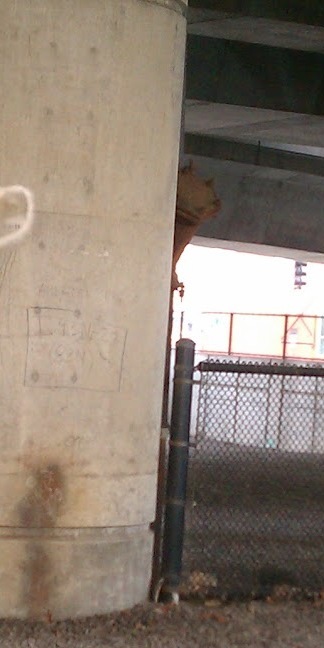 It turned out to be a rusty pipe, protruding from behind a column at just the right angle to trick my eyes. Needless to say, my mood immediately shifted from “why am I stuck here?” to “I’m so glad I had to stop”. It's a phenomenon called pareidolia! Woot!